Why Should We Live As Strangers? Copyright, 1876, by E. H. Harding. Why should we live as strangers, and cherish our pride and pain? Think of our old delight, love, when your heart was all for me. Speak but a word of kindness, and we shall be friends again. Why should the spell be broken that left us from sorrow free? Hear me And heed my sighing, let this parting be the last. -Chorus. Angels of peace, combining, are singing its fondest plea. 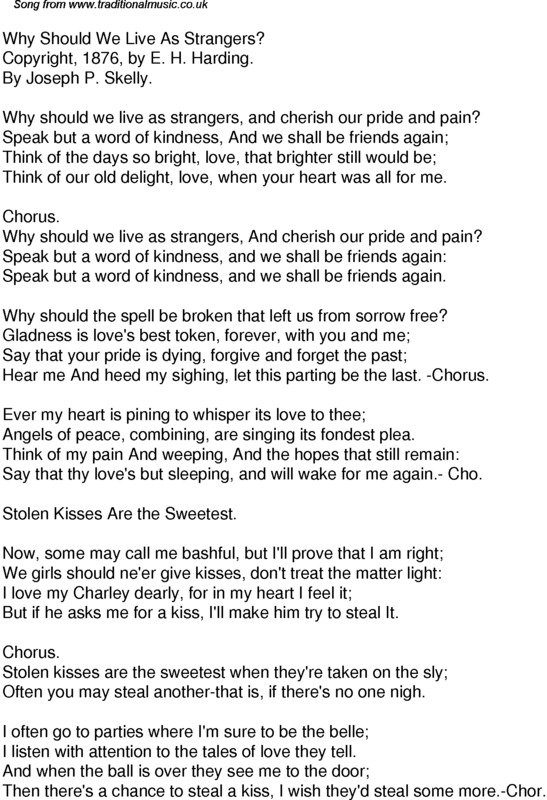 Say that thy love's but sleeping, and will wake for me again.- Cho. Stolen Kisses Are the Sweetest. But if he asks me for a kiss, I'll make him try to steal It. Often you may steal another-that is, if there's no one nigh. I listen with attention to the tales of love they tell. Then there's a chance to steal a kiss, I wish they'd steal some more.-Chor.